The James Beard Foundation's mission is to "celebrate, nurture, and honor America's diverse culinary heritage through programs that educate and inspire." Voilà Chocolat was proud to host JBF recently, and to educate and inspire the group with a class on the decadent art of truffles. See below all the delicious photos! Guided by master chocolatier Christophe Toury and our team of artisanal chocolatiers, each guest crafted their own gift box of truffles; selecting from dark, milk or white tempered chocolate; decadent ganache fillings such as Champagne, coffee, and praline; and a variety of toppings to decorate and personalize. Snacks, wine, and beer were also served. If you would like to host a memorable, informative, interactive and delicious event with us, email elaine@voila-chocolat.com. FREE SAMPLES! On Sunday, August 16, we'll be giving away FREE SAMPLES of our limited edition "Dark Chocolate Coconut Epiphany" bars, created especially to celebrate Young People's Chorus' debut at the Brooklyn Academy of Music in "Epiphany." 221 West 79th St., starting at 10am, while supplies last. If you like what you taste and want to buy some bars to bring home, 10% of the sale of each Epiphany chocolate bar will be donated to YPC. Epiphany chocolate bars can also be pre-ordered for in-store pick-up by emailing info@voila-chocolat.com. The Epiphany bars are available now through August 27. So come any time to satisfy your sweet tooth while supporting a great music program! Special thanks to Trust Science for their support of YPC and for helping to make the Dark Chocolate Epiphany Bar possible. Happy Bastille Day... today is the 226th anniversary of the storming of the Bastille, and the 225th anniversary of the first Fête de la Fédération. We're proud to have derived our name and our craft from French origins. So today at Voilà Chocolat (221 West 79th Street), we'll be sampling some of our French treats: croissants, pain au chocolat, financiers, macarons, and canelés, to name a few. We also have French vanilla soft-serve ice cream (or, if you prefer, try a tangy fro-yo) with our chefs' own chocolate sauce recipe and fun toppings and sprinkles. And voilà: your own mini-Bastille Day celebration. Stop by today and say "bonjour." Last night, Voilà Chocolat played host to the Wharton Club of New York. 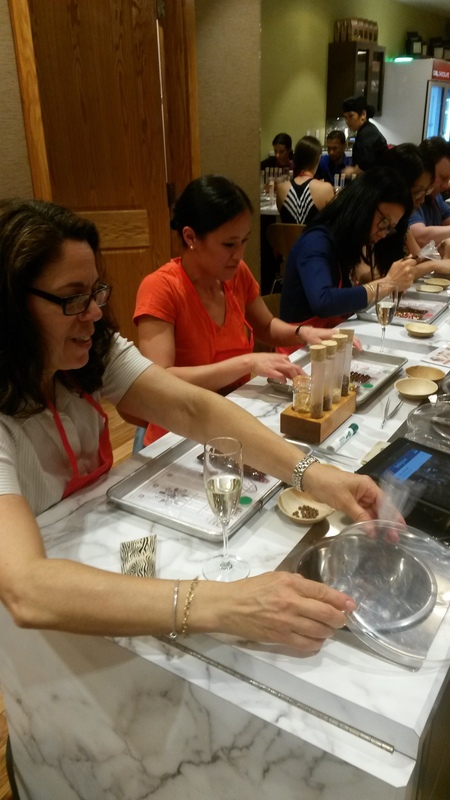 As Wharton alumni and friends sipped prosecco and socialized, they also got to do something that we're sure was never taught back in Vance or Huntsman Hall: making their own chocolate bars! The evening was especially sweet for two of Voilà Chocolat's own team. Our Chief Cacao Bean Counter (CFO) Bojan Stoyanov and Head of Mmmmarketing Elaine Boxer also happen to be two of Wharton's finest, having graduated from the business school in '99 and '02 respectively. Check out these photos of our guests taking a break from the high-pressure world of finance and senior management to stop and smell the chocolate. If you would like to bring your alumni organization or other group to Voilà Chocolat, contact Elaine. Advertising urges us constantly to buy Things, and claims that those things, once in your possession, signal success and bring happiness. That's misleading. Things cannot create a full life the same way that meaningful experiences and time with others can. We're thinking about this today, Mother's Day, because we believe the best gift you can give your mom -- or anyone you care about -- is enjoyable time and experiences. We created our company around that belief, so we could give people a place for having those kinds of experiences, learning new skills and making memories. Of course: make chocolate together. Here are some experiences we've created just for Mother's Day, and here you can make a reservation to come in and try them. It's not too late. We open at 10am and stay open until 9pm on Sundays. It's going to be a nice day in NYC. Near us, there's both Central Park and Riverside Park, where you can walk and talk, maybe bring a picnic, and just enjoy the day together. If you really want to buy her a Thing, make it an experience gift -- for a massage, a class, tickets to a performance, or supplies for her favorite hobby. We actually have some amazing Things for sale too, in addition to chocolatiering experiences. But unlike jewelry or flowers or even a greeting card, these Things come with an experience hidden inside: the experience of tasting and enjoying really fine chocolate. We also have gift cards in any amount, which are good toward chocolatiering experiences. Just take her for coffee and really listen to her. Give her your full attention. Don't look at your phone once. Talk, connect, laugh. Whatever you do, take pictures. All we want for our Earthday is good chocolate. One way you can save the planet, save chocolate, and make yourself really happy at the same time is to learn more about where your chocolate comes from and develop a taste for better quality chocolate. Inside a cacao pod - sweet white pulp surrounds bitter "beans" (really seeds). These must be fermented, dried, and ground on their way to becoming chocolate. Mass-produced chocolate ultimately serves only two objectives: high quantity and low price. What's not among those top objectives are flavor, environmental sustainability, or a living wage for cacao farmers and workers. If we all switched to consuming small, satisfying amounts of high-quality chocolate (instead of large amounts of low-quality chocolate, augmented with replacement fats and heaps of sugar), the looming chocolate shortage you may have heard about in the news would be less of an issue. And farmers would continue to choose to cultivate and harvest cacao without facing poverty or leaving their workers underpaid or unpaid. So this Earth Day, celebrate with a beautiful piece of fine chocolate. Do it for the planet! For approx 25 people. Wednesday April 15. About 5pm? And that was it. The brilliant and hard-working research team at Pzena Investment Management wanted to come to Voilà Chocolat to enjoy some team-building, to take a break from scouring the global markets for value, and to learn how to make chocolate truffles. Hurry, guys. Rakesh needs this slide by EOD. "We'd like to do something in teams." That's great. We can do that. "And we'd like it to be competitive." And so we assigned to our guests the task of making and decorating bark out of their leftover chocolate. COMPETITIVELY. Teams were to be judged (by one another) on 5-point scales of creativity, execution, and overall concept. This outlier here is the price of oil in Q4. No, wait. Sorry, it's just a cocoa nib that fell off. And the chocolatey displays of quantitative information actually were REAL! As teams presented their creations to each other, they pointed at line graphs indicating assets under management and pie charts of asset allocations. The bark creations were all so good, and the mutual judging was so consistent, that there was a scoring tie that could not be broken, even to 9 decimal places. Our own Chef had to break the tie with her professional chocolatier's assessment. Which proves one old bit of wisdom: sometimes, all algorithms just can't subsitute for long-term professional experience. They told us they were willing to put their money where their mouth is. "...in conclusion, at Pzena we not only make money for our investors, we also make our own happiness." Is it your turn next? Email elaine@voila-chocolat.com to plan a fun team-building event or other occasion. Voilà Chocolat plans to visit YogaWorks Westside on Saturday at 10:30am, during the studio's Open House. We'll share samples of dark chocolate and cacao nibs, and provide information about chocolate and your health. 1. Chocolate and Yoga are mood boosters. That feeling after a good yoga class? Blissed out, calmer, happier? A good piece of chocolate can produce similar feelings. Both help the body to release endorphins and just plain make you feel good. At Voilà Chocolat, our tagline is actually "make your own happiness," which, as yogis know, applies pretty well to yoga too. In fact, if you want to steal "make your own happiness" for your personal mantra, you're welcome to try it! 2. Chocolate and Yoga are more enjoyable the more you learn about them. Just as there's more to yoga than downward dog, there's WAY more to chocolate than the typical mass-produced candy bar. The more you learn about the origins and science of chocolate, the better able you are to enjoy it. 3. Chocolate and Yoga are healthy indulgences. Turning off your phone, turning off your mind, and spending an hour in yoga class is always 60 minutes of "me time" well-spent. In the same way, good dark chocolate is a pleasurable indulgence that provides a lot of health benefits, such as for your heart, mobility, mind, and longevity. But just as you can't derive the same benefits of yoga from simply touching your toes, not just any kind of chocolate is healthy. We'll be talking about this more on Saturday (or drop by our store any time). 5. Chocolate and Yoga are pathways to greater mindfulness. Clear your mind. Focus on your breaths. Repeat your mantra. Stay in the moment. And now, put a really good piece of chocolate in your mouth... are you in a rush to get to somewhere else, or are you savoring this sensory, sensual moment? 6. Chocolate and Yoga can be weight management tools. In addition to toning and strengthening muscles, yoga reduces stress, which can cause us to make less healthy food choices (ever hear of "emotional eating?") The endorphins and serotonins released from eating good dark chocolate reduce stress too. But in addition, good dark chocolate works actively to reduce cravings for more sugary and fatty snacks. Eating 1-2 ounces of good dark chocolate is very satisfying, so afterwards, you stop... unlike how you feel after inhaling a bag of chips or a convenience store candy bar. 7. Chocolatiering and Yoga are enjoyable activities. Most people don't think of chocolate as an activity, but that is why Voilà Chocolat exists: to show people how satisfying, creative and fun it is to make chocolate not just a treat but an active hobby. Remember when you first mastered the headstand without using the wall? Or that feeling of flying that you had the first time you stayed up in crow pose for several consecutive seconds? That's kind of like what it feels like when you release a chocolate confection from the mold and behold what you've made with your own two hands. We call it the "Voilà moment." 8. Exploring fine chocolate and practicing Yoga can improve the whole world. Now hold on. What? No, we're serious. Yoga and meditation help to teach mindfulness and compassion, which make us better human beings toward one another. Yoga means "union" -- of heart and mind, and of all people. And in doing yoga, we get to experience "flow," that feeling of deep, focused enjoyment that comes from getting completely absorbed in an activity, and that creates a transcendent sense of peacefulness. We've experienced that same kind of "flow" while chocolatiering too. In sharing this feeling with others, we're creating more opportunities for mindfulness, creativity and "union" with others. We hope that in teaching others about chocolate, such as where it comes from and who grows it, we can inspire more mindful consumer choices that will better protect the environment and help cacao growers earn a living wage. It is possible to make choices about chocolate that are more compassionate toward the planet and toward the strangers who grow and harvest cacao. We invite you to learn more...and become an active, mindful consumer of good chocolate. Once some people were visiting Chekhov. about the flavor of shredded coconut. Thanks to The Chocolate Cult for this behind-the-scenes look at two of the creative forces behind Voilà Chocolat! Next in our series of introductions to the people behind the brands we test and reveal to you all is our very first two-person email interview. Today we are going to meet the founder of Voilà Chocolat, Peter Moustakerski and Christophe Toury the Master Chocolatier at Voilà Chocolat. As always our guests words will be in italics for reading clarity and I'll start each question with their first names so you don't get confused, Sisters and Brothers in Chocolate, when the questions directly related to each man. Peter, how did you get the idea for Voilà Chocolat? I've always loved eating chocolate since I was a kid. In the 1990’s, when percentage numbers started appearing on chocolate packaging (thanks to John Scharffenberger), I took a somewhat geeky interest in what those meant. I started tasting darker and darker (and pricier and pricier) chocolate bars, and learning to taste the difference between over-processed mass chocolate and small-batch artisanal bars that utilize quality beans. Later, I decided to allocate more time to my chocolate passion, and started taking a variety of courses: I took master chocolatier and bean-to-bar maker courses at École Chocolat, took the chocolatiering course at the French Culinary Institute, and travelled to Costa Rica to visit cacao growers, researchers, traders, and chocolatiers. Along the way, I learned quite a bit about every aspect of the business, artistry, culture and history of chocolate. As I encountered many wonderful experiences, I wondered why no business is bringing these experiences in a compelling, user-friendly retail environment to discerning consumers in the US and around the world. And that’s how the idea of Voilà Chocolat was born. The actual ‘epiphany’ about launching Voilà Chocolat came to me during my daughter’s 10th birthday party, which we had at a ‘make your own’ pottery/arts and crafts place. When I saw how much fun both kids and adults were having and how immersed they were in their creativity, I thought: this could be done with chocolate too. At that point, I knew what we had to create with Voilà Chocolat. Peter, what were some for the logistical challenges you had to overcome to create Voilà Chocolat? Too many to recount, from enlisting the right financial supporters to securing the right real estate. But one very interesting challenge was how we could help amateur chocolatiers (our customers) to get professional results when working with tempered chocolate. Professional chocolatiers temper their chocolate and then work with it quickly. But a guest at Voilà Chocolat might be working with their chocolate for 30-45 minutes, and we don't want the chocolate to go out of temper while they are creating and having fun. We are proud of our technological solutions, which we developed with the help of Dennis Teets, our Chocolate Scientist (what a great title!) Our patented, self-heated workstations help solve this logistical problem, and allow guests both to achieve professional results and to have a comfortable place to sit and work together. Peter, how did you meet Christophe Toury? The chocolate industry, particularly in New York City, is a small and intimate field of people. As I researched and developed the idea for Voilà Chocolat, I connected with a lot of great people who shared their expertise and advice with me, and who in turn introduced me to others who might be helpful. One of those conversations eventually led me to Master Chocolatier Christophe Toury. It was one of the most fortunate connections among the many I've made throughout this long process of developing and launching Voilà Chocolat. Christophe is incredibly talented, and he is a great partner who has put so much of his own ideas into Voilà Chocolat to make it even better than I imagined. Christophe, you have a very impressive background as a pastry and chocolate chef. Could you tell our readers briefly about that? In Paris, France, I started early at Les Bains and at a pastry shop called Patachou, where I created and decorated many desserts for celebrities, decorated cakes and made various pastries and regional tarts. Even in my military service, I produced all the desserts and pastries for the Officers and Generals at the Ministry of Defense in Paris. And then my career was at the Ritz Hotel in Paris at L'Espadon, producing all desserts for the hotel including big show pieces; production consisted of the famous Escoffier Heritage. Les Compagnons du devoir that I was exposed to at an early point in my life is where I met my mentor Andre Renard who assisted me in coming to the US. He is a philanthropist at heart, and in that way he is like all the members of Les Campagnons -- they share their knowledge and life philosophy with all those they encounter. After that: Essex House, Four Seasons in Maui and in NYC, Executive Pastry Chef there and then also at the Manadarin Oriental NYC, and then Chocolatier and Executive Pastry Chef at Jacques Torres Chocolate. And now, Master Chocolatier at Voilà Chocolat! Christophe, your brief bio on the Voilà Chocolat website says that you enjoy making chocolate sculptures just for fun. How did you get into that and would you share an image of one of them with us? Throughout a career as a Pastry Chef, we are exposed to chocolate and it’s part of the curriculum. Chocolate has a very distinct way of responding to creativity. It almost makes you feel like its alive and very mystical. You can do almost anything with chocolate and I am inspired by that. To become a chef, I had to make huge show pieces in France, really complicated amazing things. From that I learned you can do almost anything with chocolate, with enough skill. In the attached photo, I made a NYC fire hydrant by hand out of chocolate (it's about 60% scale size). I saw near my home in Astoria, Queens that someone had made a fire hydrant into art by painting it, and I just thought I could make art with chocolate by making it into a fire hydrant. Sometimes you don't need a big reason or a purpose, you are just inspired by the things around you. The Voilà Chocolat team had Thanksgiving dinner together this year (in the store before opening, while the space was still under construction!) and everyone's children had fun smashing that fire hydrant like a piñata, and then everyone enjoyed eating the chocolate. Christophe, given your background what attracted you to Voilà Chocolat? Throughout my career as a Pastry chef I’ve done pretty much everything from the opening of a five star hotel to working with a celebrity chef as the Creative Director, therefore what excited me about Voilà Chocolat was The UNKNOWN! It was totally different than anything I’ve ever done which to me equals a challenge. Also, the structure and uniqueness of the concept made everything much more attractive. Voilà Chocolat makes chocolates that folks can buy but your focus is on parties. Would you tell us more about them? Our parties are totally unique and incredibly fun, because everyone gets to make beautiful gourmet chocolates together! When someone hosts a party at Voilà Chocolat, you're not only giving them a fun time but also a unique experience, a new set of skills, pride of craftsmanship and a fresh appreciation for how fine chocolate is actually made. Enjoyment of chocolate is almost universal, so all the attendees love it. It's especially great for corporate events, team bonding, or bridal showers, because these are events where not all the guests may know each other well yet, and sharing an enjoyable experience together (such as chocolatiering) brings people together with new experiences in common. Does your company do more parties for children or adult groups? We are actually designed for adults, but children obviously love making chocolate too. What we have found since we opened in December is that even though the experience is not designed for kids, children do really well with it and have a great time. So I'd say the split is pretty even for now, partly because there are so many kids living on the Upper West Side of Manhattan, and they have birthday parties all the time. But more and more companies and other folks outside our immediate neighborhood are discovering us, so we're starting to welcome many more people for team outings, bridal showers, corporate events. Which do you find the most fun to throw -- parties for adults or children? They are both fun in different ways. The kids' parties are amazing because they are literally "kids in a candy store." Children really love applying all their creativity to their chocolates (and sometimes licking the chocolatiering tools). It's also very gratifying to watch kids learn and absorb facts and knowledge about the science of chocolate. It's like all the best things from both art class and science class in one fun party where they can be with their friends. On the other hand, watching adults being transformed almost into kids again themselves by the magic of chocolate is amazing too. We had someone celebrate his 72nd birthday with us, and he pointed out to us that he was having as much fun as another birthday celebrant in our atelier who was turning 6. Adults are able to ask deeper questions about the science behind chocolate and the deep history behind the technique, which is very gratifying for us and for them. One of the values upon which Voilà Chocolat was founded is Education, so we really relish the opportunity to share what we know about chocolate. We've also had teenagers' parties, and all of the 15-year olds and 17 year-olds had a great time. Chocolatiering is probably one of few activities that makes teens want to stop texting and put down their iPhone! It's a great equalizer. One man in his 80's came in with his wife and children and grandson and they all made chocolates together - it was their first outing together after he had been released from the hospital from getting a heart transplant; he chose to make heart-chaped chocolate Voilàllipops to give to his cardiac surgeons. At the other end of the spectrum, we had a young little guy visit us whose caregiver said he suffered from very severe ADHD, and she said that she'd never seen him as calm and focused for an entire hour as he was while making chocolates with us. I've always felt that losing yourself in creative expression with chocolate can be therapeutic, and in these last two examples, that was literally true! People of all ages really get into learning how to make chocolate confections, even more than they imagined or expected. Finally, working with chocolate can be seen as scary or difficult by the average person. What is your advice for anyone who is thinking of trying to make chocolate at home or to come to one of your parties? Chocolate is endlessly fascinating and there is so much to discover about it. There is no reason to be intimidated by what you don't know yet - just start learning and exploring! Tempering and working with chocolate at home might be difficult, but there are many classes and resources to learn how to do it (soon Voilà Chocolat will offer such advanced classes as well). One of the very reasons that Voilà Chocolat exists is to provide an accessible and welcoming place to work successfully and satisfyingly with fine chocolate, without having to learn the trickier aspects of tempering or to take an expensive and time-consuming course to learn very advanced technique. Voilà Chocolat was created precisely in order to bring the joy of chocolatiering to the average consumer, and to remove the barriers and make it welcoming and accessible. We're a very pan-European bunch at Voilà Chocolat. Though based in NYC, our team hails from France (bien sûr), Germany, and Bulgaria. We're actually a little overrepresented with Bulgarians around here. This is very nice for us, because we find that Bulgarians tend to be very friendly, pride themselves on their hospitality, and have some lovely traditions that most New Yorkers have never heard about before -- although the Wall Street Journal recently helped spread a little knowledge about Bulgarian culture. The common belief is that by wearing the red and white colors of a martenitsa, people ask Baba Marta for mercy. They hope that it will make winter pass faster and bring spring. At the first sign of spring, such as a returning stork or emerging blooms, they tie their martenitsa to a blossoming tree. As we face yet another 3" of snow in NYC tonight, we hope to see more signs of spring soon. If wearing martenitsi bring this about, then so be it! Stop by our store at 221 W. 79th St., where we are sharing and wearing our martenitsi today. We have them tied on our "tree" in our window too. Why so soon? Because (no kidding, we are not making this up...) moments after we put up a poster about Baba Marta in our window, we saw a sparrow outside, flit down and perch on the snowbank on the curb. We cannot remember when we last saw a little bird in NYC this winter. Call it superstition, but we just saw it working, with our own eyes. We believe in creative expression so much, that we built a public space and a company around giving people a space and a means to do it. We express ourselves creatively through chocolate... but painting, dancing, knitting, or singing are all important forms of creative expression too. We love them all! That is why Voilà Chocolat is proud and excited to support local arts organizations such as the Young People's Chorus of New York City (YPC). It is the mission of YPC to provide children of all cultural and economic backgrounds with a program of music education and choral performance that seeks to fulfill each child’s potential, while creating a model of artistic excellence and diversity that enriches the community. That is a mission we can really get behind! So in conjunction with YPC's upcoming Gala on March 2, Voilà Chocolat is offering a unique opportunity for you to create your own chocolate and to have it produced, labeled and sold to the chocolate-loving public in our Upper West Side chocolatiering shop. During a personal consultation and collaboration with Voilà Chocolat's famous Master Chocolatier, Christophe Toury, you will design and name a chocolate truffle, a chocolate bar or a chocolate lollipop with the flavors, ingredients, and design of your choice. The chocolate creation that you design and name will be handmade by Voilà Chocolat's professional chocolatiers, and will be featured and sold in the Voilà Chocolat shop for 1 month, with part of the proceeds from the sale of this item to benefit YPC. 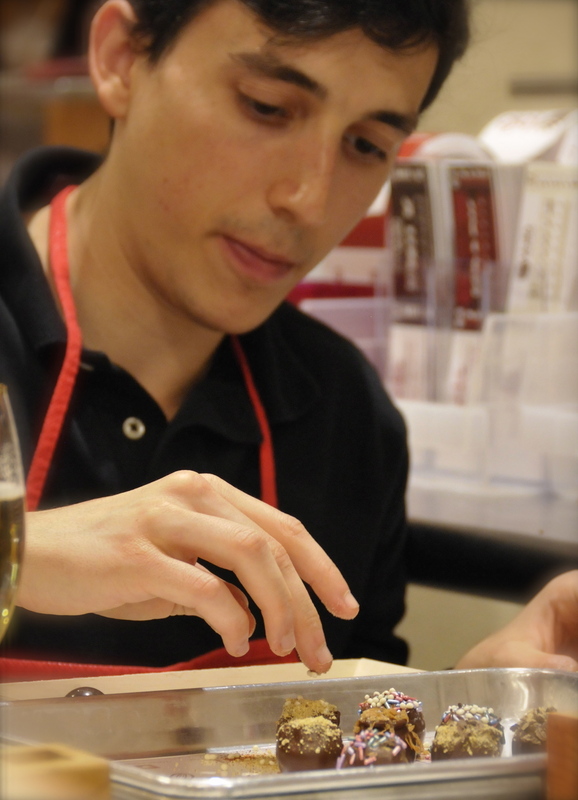 You can become a famous Manhattan chocolatier without even spending one day in culinary school! When will you ever again have the opportunity to design your own best-selling chocolate in collaboration with a former Executive Pastry Chef from the Four Seasons and Mandarin Oriental Hotels, and to see it sold in a Wall Street Journal- and New York Times-acclaimed chocolate shop? Usually we extol the virtues of making chocolates yourself. But today we're going to admit that sometimes you don't have to make it yourself. You're very busy, we know. And you want a gift for Valentine's Day that will impress. So we've got you covered (in chocolate?) We have unique, delicious, and adorable chocolate gifts for you, hand-made on site in our shop at 221 West 79th Street. Come on by! Our shop and chocolatiering atelier is open until 10pm tonight. Love "stamps." Make an impression. Heart-shaped chocolate "rattle" - break it open and "hugs" & "kisses" spill out, along with strawberry crisp pearls. Surprise! Classic hand-filled truffles in a 16-piece gift box. Very expressive chocolate bars. Expect your beloved to say these things to you after tasting them. Dogs can't eat chocolate. And you can't resist this chocolate doggie. Valentine’s Day will be amazing this year at Voilà Chocolat! If you plan to have a special date or outing with us, then you are in for a treat. We’ve created things for you to make this a day like no other! Due to overwhelming demand, if you have made a reservation for Valentine's Day, Saturday February 14, we ask that you please email us to confirm your reservation. Important to note: our special Valentine's Day menu of 5 exclusive chocolatiering experiences are $65 to $88 per person, and seating priority will be given to guests who are completing at least one chocolatiering experience per person. On Saturday, February 14, we will be offering these 5 special Valentine's experiences only. Our regular chocolatiering experiences menu will return on February 15th. Sweet wishes from the Voilà Chocolat Team! Delicious snowball? Go ahead and throw one at a friend, they'll like it. Ok, you're right, that's not a photo of real snow. That's a white chocolate truffle filled with fresh mango purée and rolled in coconut. It's much prettier (and tastier) than the slushy stuff lining the city streets at the moment. Now: Check your batteries and flashlights and other stuff you're supposed to have for emergencies. Day before next snow: buy bread and milk! We don't know why, just do that. 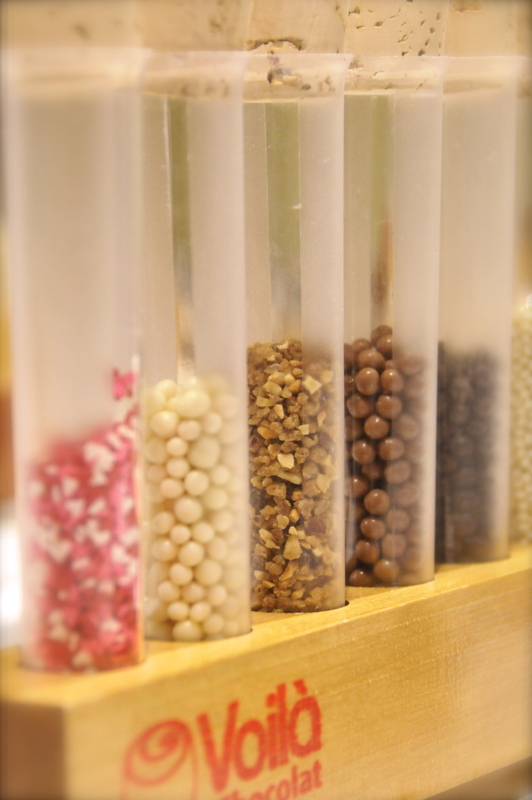 Reserve your time for chocolatiering at Voilà Chocolat. You don't need to make a reservation; you could also just walk in. But you'll probably make a reservation anyway, because you're smart and prepared! Decide what experience you'd like to have at Voilà Chocolat. Actually you don't have to decide in advance. You can decide when you show up. But, it's fun to think and dream about what you're going to do with chocolate, so go ahead and mull it over while Snowmageddon keeps you stuck in your apartment. Morning of snow day: Boots, hat, mittens, and get outside! Walk around in the winter wonderland and take pictures before all the cars and dogs get to it. Once you're cold: Head to 221 West 79th St. Warm up with a delicious hand-made hot chocolate or coffee, and a wee snack. We have oatmeal chocolate cookies, financiers, and little lemon cakes. All baked fresh in our kitchen every morning. Sit down, put on your apron, and learn artisanal chocolatiering techniques while you make amazing things out of fine tempered chocolate. Lick the tools and utensils while our backs are turned. Voilà! (so to speak). You have made your own beautiful chocolates and had the most memorable, delicious, educational and cozy snow day ever. On your way out, pick up one of our house-made hot chocolate mixes to enjoy at home - choose from 72% cacao House Blend, or our 8-spice Daredevil blend. Walk home together in the snow with your edible treasures, and start planning your next visit. Go forth! You have a plan! Click on the screen capture above to watch the 2-minute Fox5 news segment "Ebola and chocolate," on global chocolate supply and pricing pressures. "An Ebola outbreak either bordering or a nation away from the two countries that produce as much as 75 percent of the world's cacao beans may change the makeup of a Cadbury egg in the United Kingdom." Chocolate hit the news again in the past couple of days. So local TV news station, Fox5 WNYW, asked the professional opinion of our own Peter Moustakerski ("moose-tah-CARE-ski," the reporter diligently typed into his notes). The backstory: Cadbury -- owned by Kraft Foods since 2011 -- will be making their iconic Creme Eggs with a different form of chocolate in the UK this Easter, and British fans have been expressing their outrage online, alleging that the confection seems to taste cheaper. The original Cadbury Dairy Milk shells, which contained 20% cocoa solids until now, will be made with a sweeter kind of chocolate containing only 14% cocoa solids. Heading in this direction means fewer healthy flavonoids and possibly the aforementioned "horrid" decline in chocolate flavor. What Kraft probably aimed to reduce along with the cacao content was cost, in order to protect margins on an already low-price product as chocolate supply is becoming more expensive. Why so expensive? To produce chocolate, farmers and workers have to be fairly paid, and shortcuts that might produce a higher yield or lower price can result in inferior tasting chocolate and/or less economically or ecologically sustainable cacao-growing. If consumers are not willing to pay, then margins must be protected some other way - possibly by de-emphasizing quality, economic fairness or ecological sustainability. Underpaid farmers either abandon cacao-growing in favor of other work, thus further reducing supply, or they feel pressure to underpay and abuse their own workers. This is why, unfortunately, social ills may be a hidden ingredient in the chocolate that much of the first world consumes. An additional source of stress on the global chocolate supply (and the catalyst for this TV news story) is the recent Ebola outbreak. This human health crisis has restricted would-be workers' ability to cross borders, so there are fewer people to harvest and process cacao. There is also an ongoing plant-based health crisis, as diseases are increasingly impacting cacao trees, and climate change is making already limited cacao-growing regions hotter, drier, and less hospitable to the theobroma cacao tree. Research suggests that by 2050, the amount of land suitable for growing cacao in Ghana and Ivory Coast - where 70-75% of the world's cacao is grown currently - will shrink to one third of what it is today. All of this means an interrupted and reduced cacao supply, and purveyors of mass-produced chocolate with very large volume needs and very small margins are feeling the squeeze. Thus, perhaps, the decision to reduce the cacao content of Creme Eggs. Rather than pursue even lower-quality chocolate to keep prices unnaturally low (while keeping farmers and their workers underpaid), we'd like to help consumers to learn and accept that good quality chocolate should and will cost more than we are used to paying for mass-produced chocolate at the convenience store. Greater appreciation for quality chocolate may result in consumers becoming more willing to pay fair prices to enjoy better-tasting chocolate that they know is sourced in an economically- and ecologically-stable manner. Plus, economies and workers that are fairly compensated can afford better infrastructure and have greater motivation to protect their economic interests. In other words, if we pay fair prices for chocolate, it could improve lives and even stabilize nations. At the very least, let's try to refute the allegation that "Americans don't get chocolate." Ouch! Voilà Chocolat sources its chocolate from Guittard Chocolate, a 5th-generation family owned, 145-year old San Francisco based company, which maintains close, long term relationships with its cacao growers. By using this source of chocolate, we provide you with better flavor, and together we help small farms and cooperatives to sustain a livelihood for their families. Better cacao sourcing is worth a hill of beans. Transfer sheets allow chocolatiers to put beautiful designs and patterns directly onto chocolates, almost like magic. For corporate events and custom orders, a transfer sheet design featuring your logo, your client's logo, or another design or message can help you create big impact with small chocolates! With some advanced notice (~3 weeks) Voilà Chocolat can pre-order and provide custom transfer sheets for your visit. We also have some pretty neat patterns on hand. The moment the design is revealed on the chocolates is always fun. Plaquettes (literally, "small plaques" in French) are small circles of chocolate with your logo or design, which can be used to top round chocolates like truffles. Here is how a plaquette with your logo or design looks on a truffle. Interesting colors and designs, right on the chocolates. Transfer sheets can get pretty wild! Join the founders of Voilà Chocolat for a private, somewhat impromptu New Year's Eve celebration! After dinner, come make your own dessert. Starting around 9:30pm, spend the waning hours of 2014 in our cozy atelier at 221 West 79th Street making your own artisanal chocolates and sampling some of our master chocolatier's own exquisite creations. Then start your new year off with a goody bag filled with fine chocolates and a resolution to eat better chocolate in 2015! A cover of $150 includes chocolate-making, chocolates sampling, champagne, goody bag, and merriment! May also include philosophical discussion with passionate chocolatiers about chocolate production or whatever else becomes more interesting with a glass of champagne in one's hand. Reserve online or RSVP to events@voila-chocolat.com. p.s. we will open at 1pm on Thursday January 1st. Some very fun and creative guests made us a little Flipagram of their Voilàllipops-making experience with us today. Both chocolatiering and filmmaking in one day! It's December 26, which means it's Boxing Day. Poor Boxing Day: obscure, misunderstood, overshadowed by the day before. One vaguely senses that Boxing Day may have to do with British servants celebrating Christmas a day later than their masters. Or maybe it has to do with boxing up all the gifts you didn't like and exchanging them? Perhaps Boxing Day is just a shopping holiday, when retailers discount boxes and boxes of things they didn't sell before Christmas. We at Voilà Chocolat humbly submit that Boxing Day should celebrate incredible Orangettes in adorable wooden boxes. What are Orangettes? They are an ecstatic union of sweet candied orange peel and bittersweet crunchy silken chocolate. The simplest foods are often the most satisfying yet the hardest to get just right, like the perfect scrambled egg or al dente pasta. And what could be simpler than a mere three-ingredient confection: orange peel, natural sugar, fine tempered chocolate? That's all it is. And that's what makes it so hard to get right. With his usual talent and aplomb, our Master Chocolatier has achieved the perfect balance of these three basic ingredients. Our Orangettes are nothing short of a triumph (if you're into chocolatey-orangey triumphs). And yet, pity the poor Orangettes: since the boxes don't reveal their glorious contents at a glance, and since many people may not know what an "orangette" is just from the name, our Orangettes feel obscure, misunderstood, and overshadowed by the see-through boxes of decadent truffles and striking eco-tubes of housemade hot chocolate mixes on our shelves around them. So we would like Boxing Day to become a day for boxes of Orangettes. We present our Orangettes to you swaddled in parchment paper inside unique balsa wood boxes. The boxes alone are pretty cool, and no doubt you will find other uses for them once you've consumed the contents (which we predict will take 48 hours or less, since they're that hard to resist). Visit our chocolatiering atelier and store at 221 West 79th Street any time between 10am and 10pm on Boxing Day -- Friday December 26. Request a "Boxing Day Sample." And from behind the counter, we'll reveal our secret stash of samples of these chocolate-covered jewels for you to try. We bet you'll leave with a box.